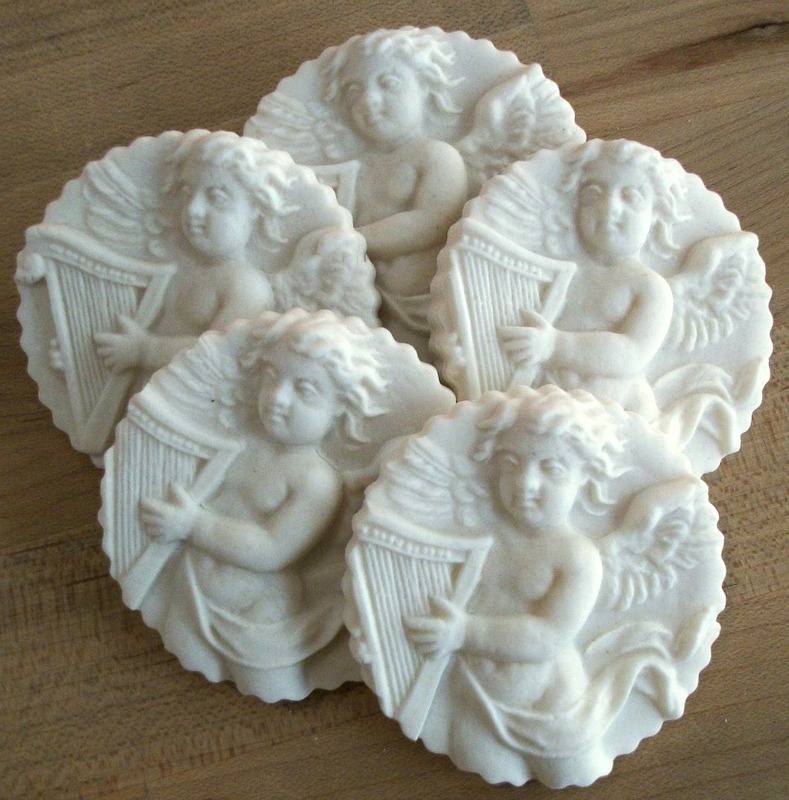 Welcome to The Springerle Baker’s on-line catalog for Angels & Cupid molds. 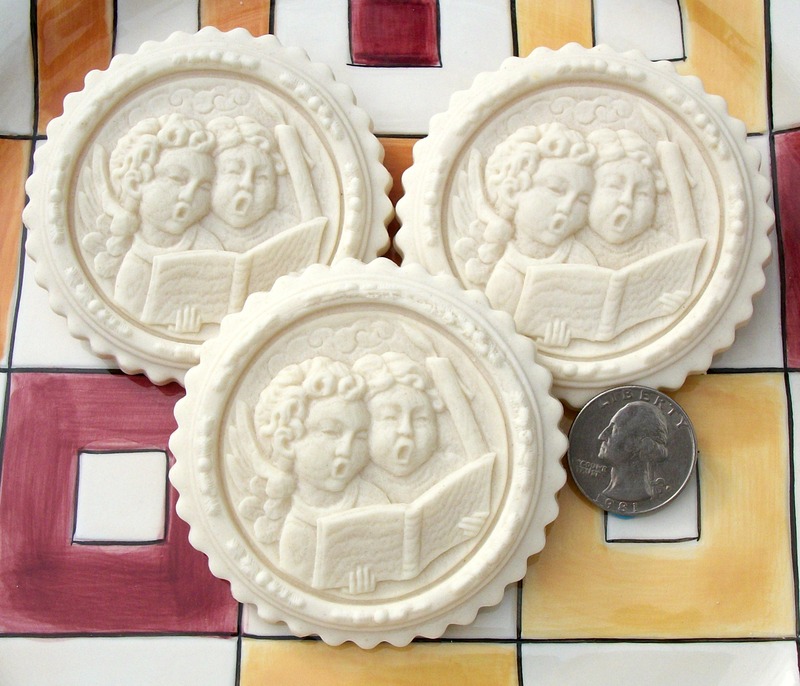 This mold measures about 3″ in diameter and features two Angelic carolers. 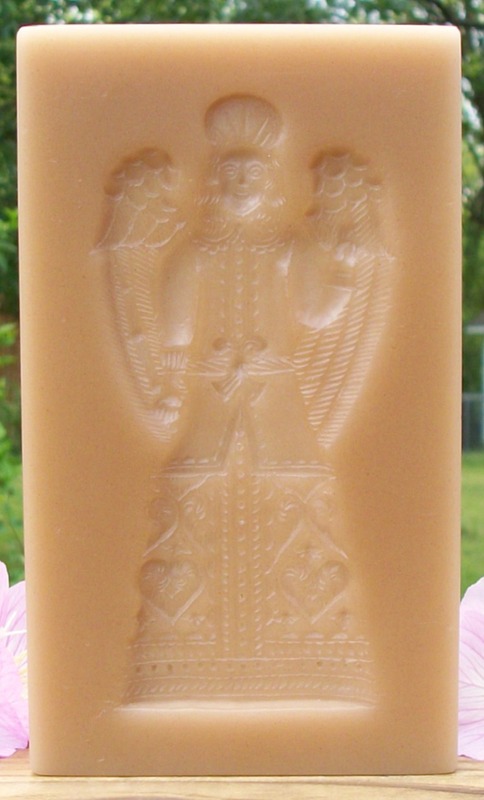 The images that this mold produces are very dimensional and detailed from the Angels curly hair to the feathers in their wings. The carolers, singing by candle light, are bordered by a border that is decorated with pine and berries. The carving was done on very grainy wood, thus giving the unique look that it does. Notice the grain on the back of the book. This is a beautiful image and a produces a great sized cookie. This mold has grooves on its sides to assist in lifting it from the dough. This mold is #75 and sells for $37.81. 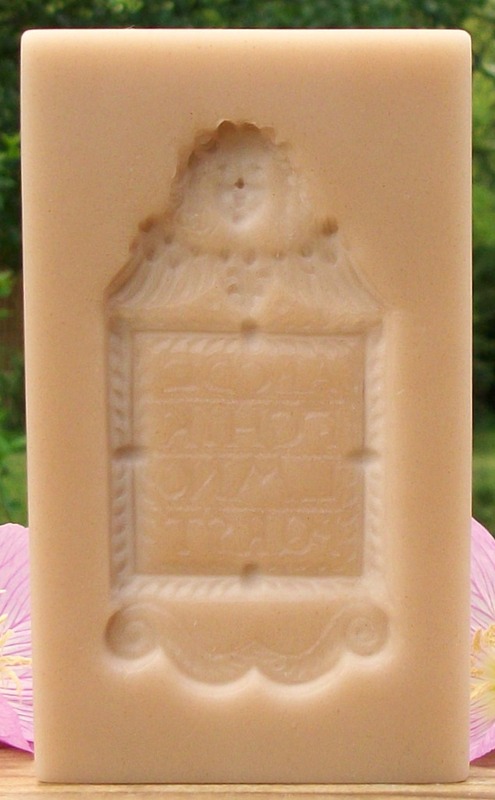 A clear or color tinted copy of this mold will cost an extra $4.73. 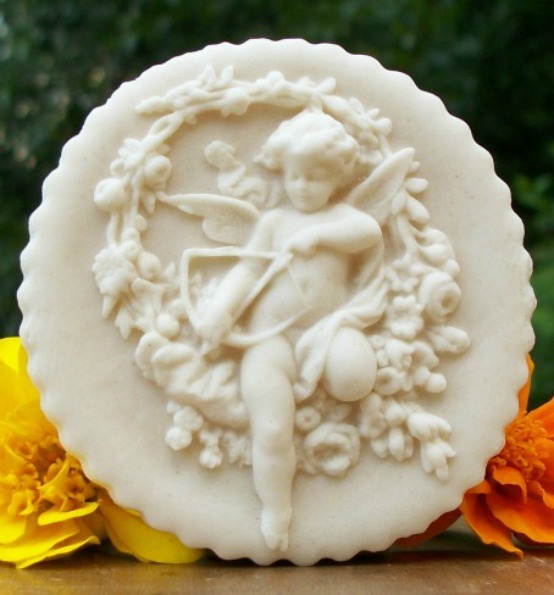 This mold measures about 2 3/4” x 2 3/8” and produces a beautiful image of Cupid amidst the garden flowers getting set to let his arrow fly for a new love to blossom. This mold produces one of the best detailed images I have seen. The depth and details are fantastic assuring that this mold will be sure to please. This mold would produce the perfect sized cupcake topper and a sure show stopper for you anniversary, shower, wedding reception, or Valentines treats. Tinted with edible colors this would be a sure beauty! This mold is item #217 and sells for $34.95. 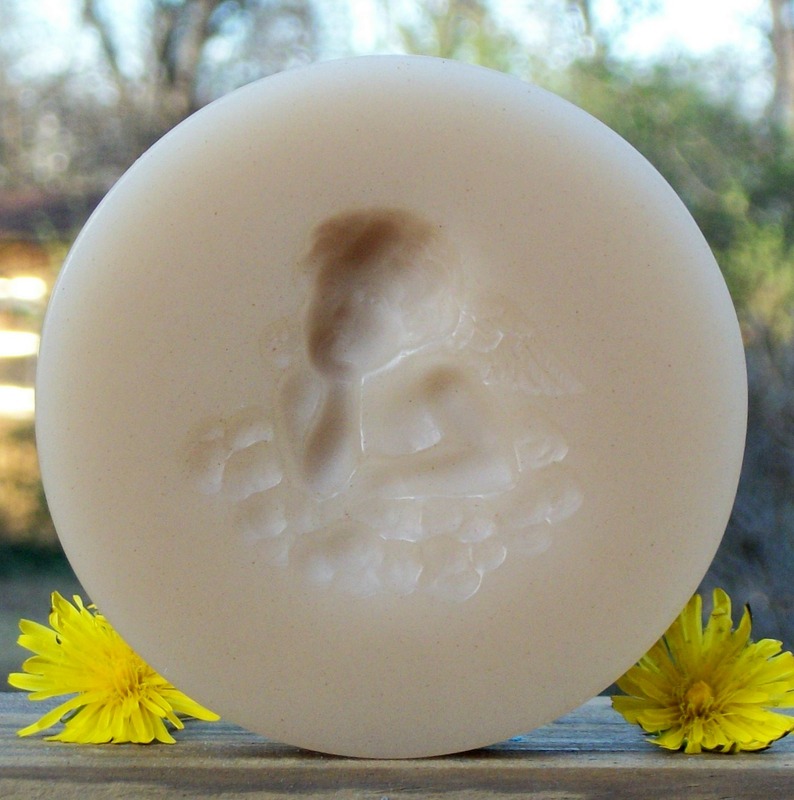 A clear or color tinted copy of this mold will cost an extra $4.37. 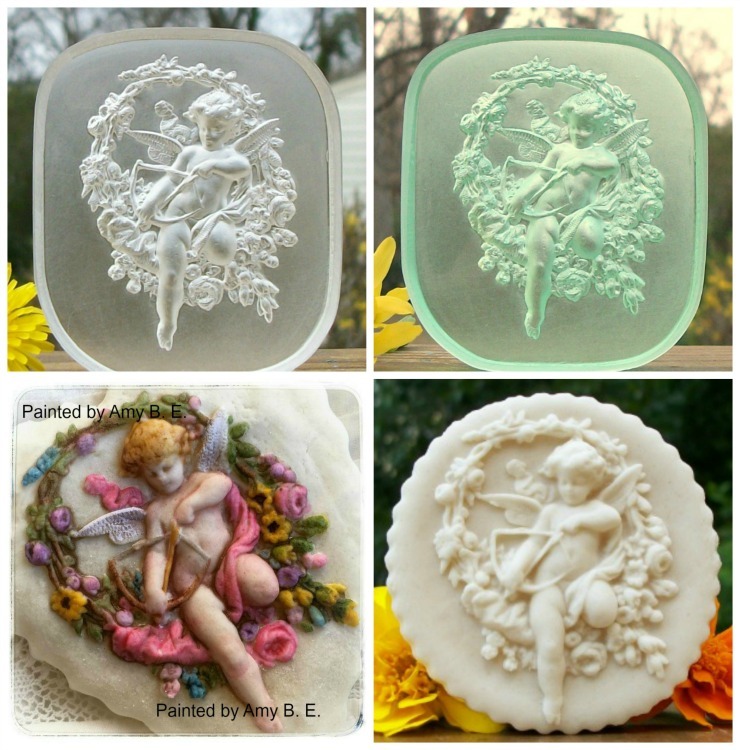 #217 Cupid in Flowers Molds in Clear and Green, plus cookies. 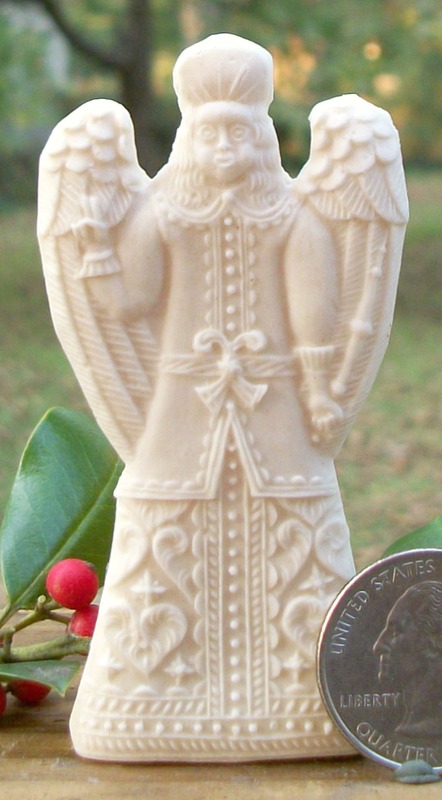 #2337 Angel with Flower Mold – $16.05. 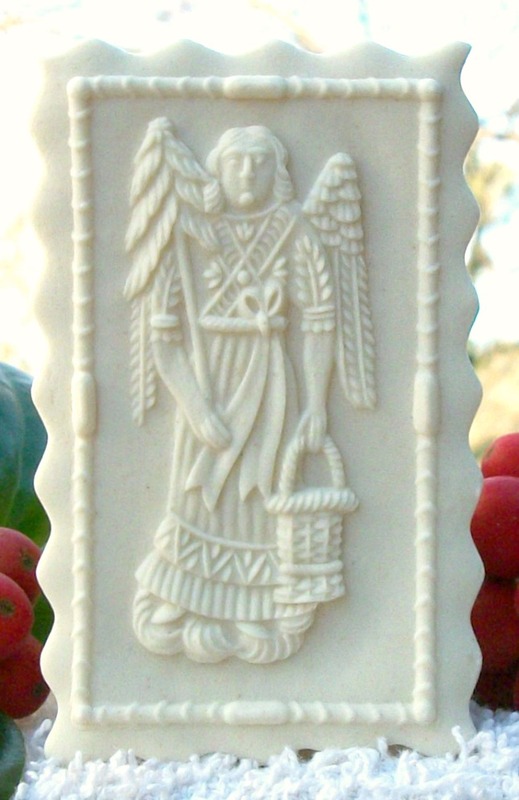 This mold measuring about 2 3/16” x 1 5/8” depicts a detailed and dimensional Angel carrying a wreath and a flower. A fine size for your cookie tray. This mold is #2337 and sells for $16.05. A clear or color tinted copy will cost an extra $1.81. Cookie made with mold #2337. 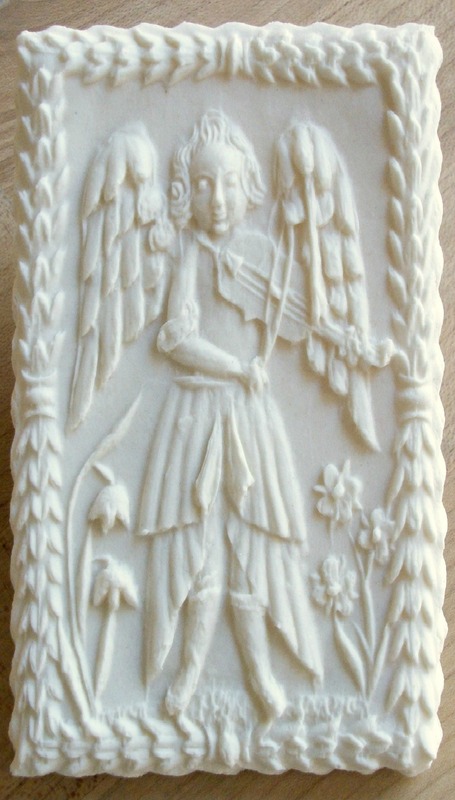 The Lieb Angel replica mold measures about 5 ½” x 3 ½” and depicts an Angel playing what looks to be a violin. The image is beautifully carved and has a very nice border. I’m not sure of the symbolism that may be present and it may well just be a beautiful image. Consider that folks maybe as far back as the late 1600’s were gazing upon this image and giving it as a token to a friend or loved one. This replica is #1637 and sells for $64.95. A clear or colored tinted copy will cost an extra $8.12. This mold is also available in a smaller size (#409). Cookie made with Mold #1637. 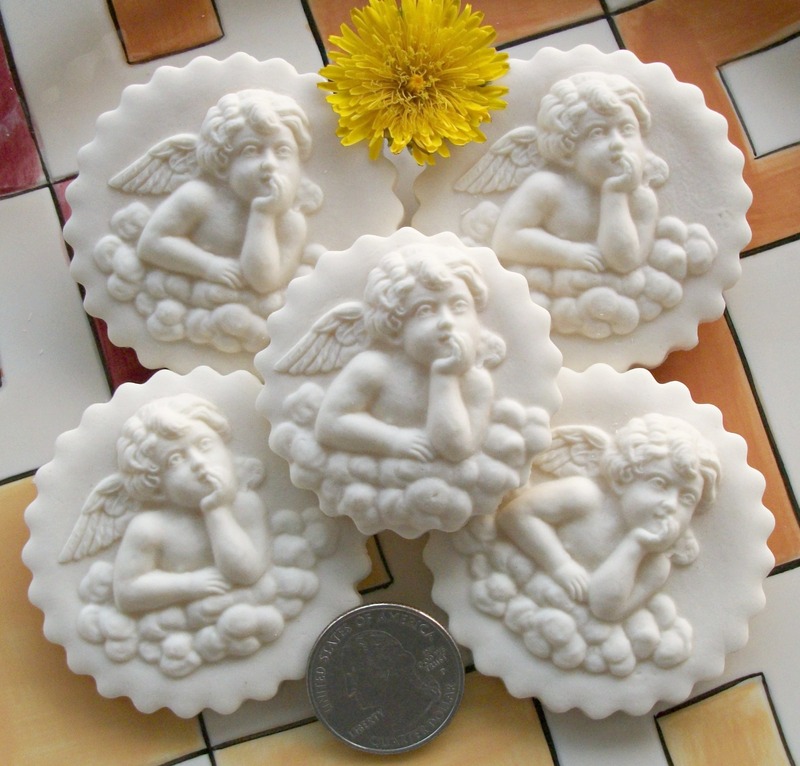 #409 Small Lieb Angel Mold – $26.95. 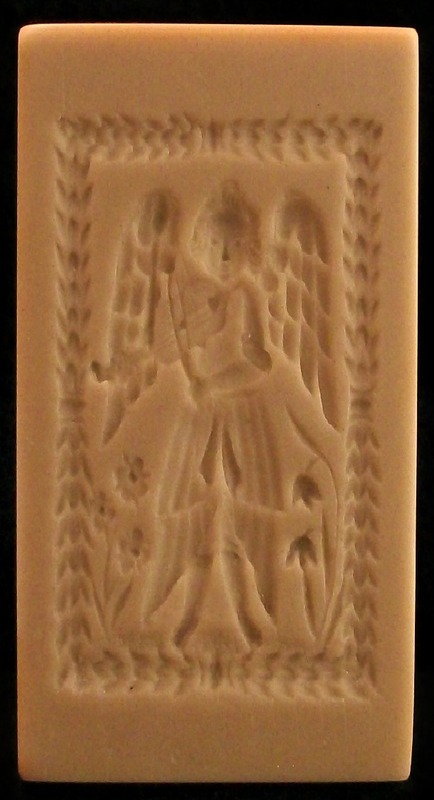 This is the smaller version of the Lieb Angel mold #1637 and measures about 2 5/8” x 1 ¾”. This smaller version captures all of the same details and mystery of the larger mold. It produces a cookie or confection that is much easier to include on your cookie tray or dessert displays. 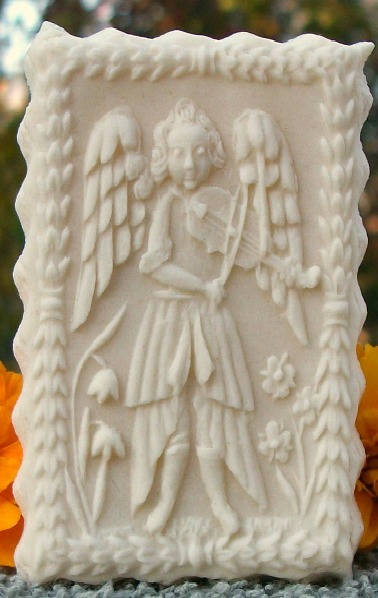 The Lieb Angel mold depicts an Angel playing what looks to be a violin. The image is beautifully carved and has a very nice border. I’m not sure of the symbolism that may be present and it may well just be a beautiful image. Consider that folks maybe as far back as the late 1600’s were gazing upon this image and giving it as a token to a friend or loved one. This mold is #409 and sells for $26.95. A clear or color copy will cost an extra $3.40. Cookie made with mold #409. For comparison: Cookie made with mold #1637 and #409. 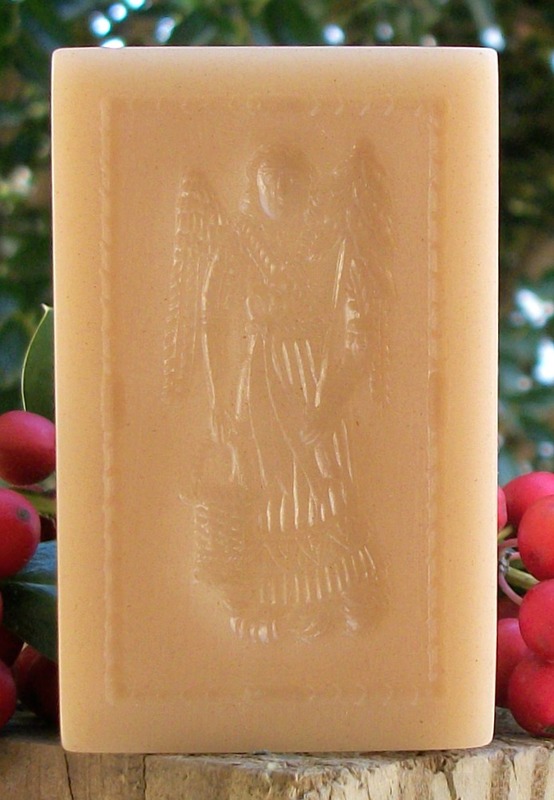 #478 Tiny Cologne Angel with border Mold – $26.25. This mold measures about 2 3/4″ x 1 3/4″. 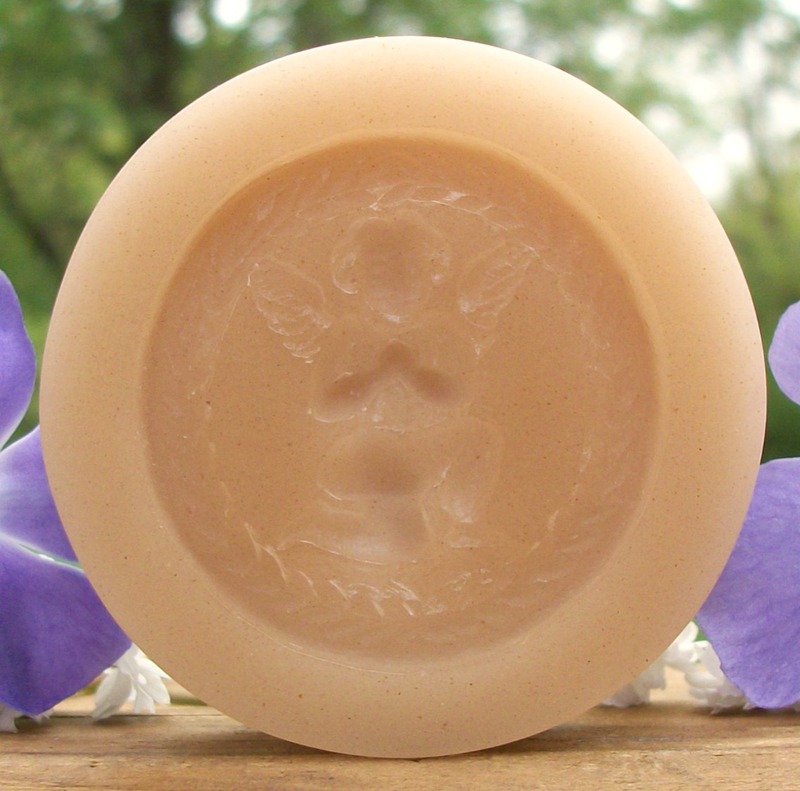 It is a tiny version of our Cologne Angel mold #1541. 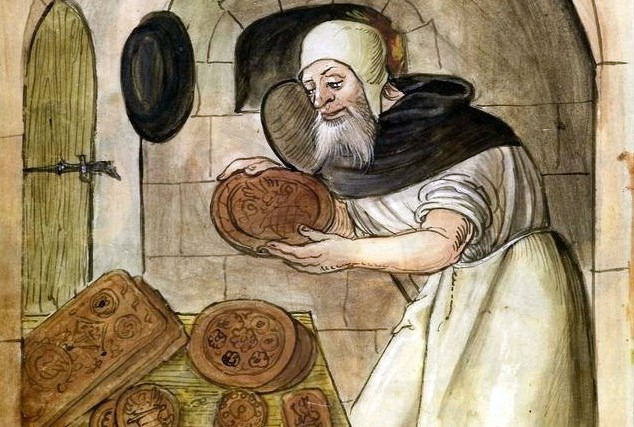 Alice liked the design, but it was simply too large to fit in with most other selections on cookie trays. So, we took it down and added a decorative border. 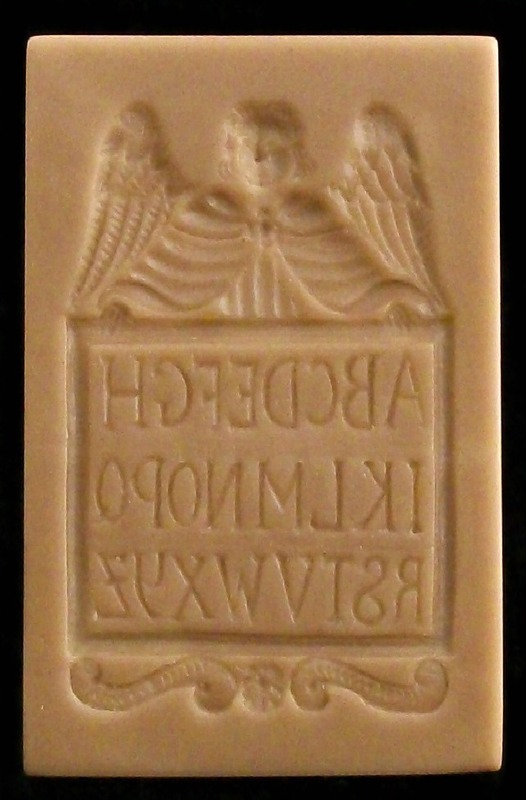 The original mold was used for Gingerbreads and Spekulatius but this mold is perfect for Springerle and confections. The detail and dimensions are amazing and will add to your cookie trays or dessert displays. This mold is #478 and sells for $26.25. Cookie made with mold #478. 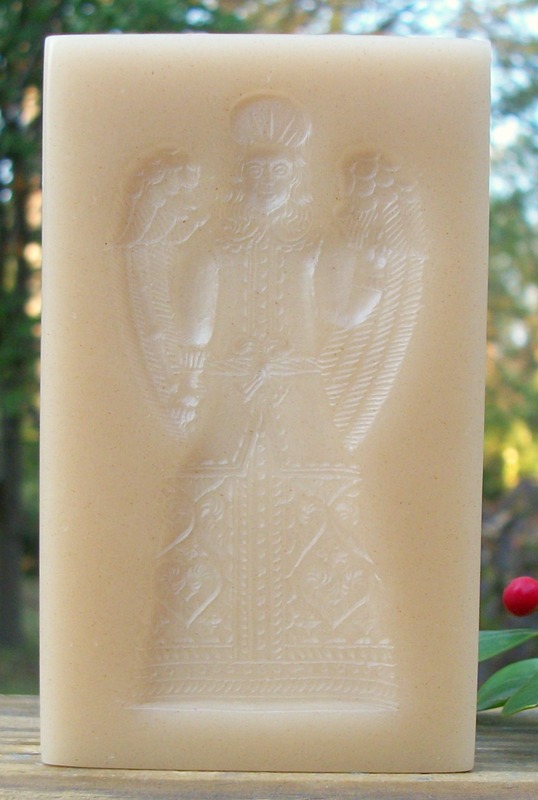 #478 Tiny Cologne Angel with border Mold in Clear. 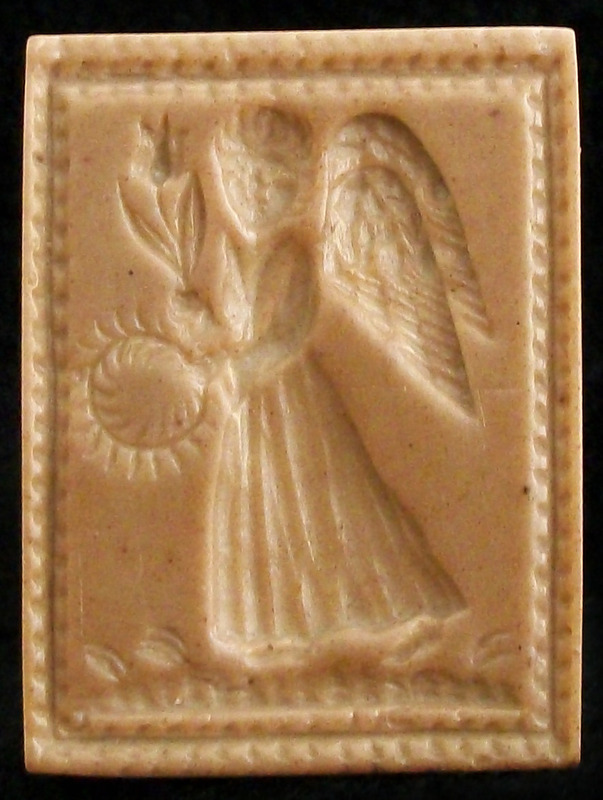 #1754 Muenchen Angel Mold – $68.11. 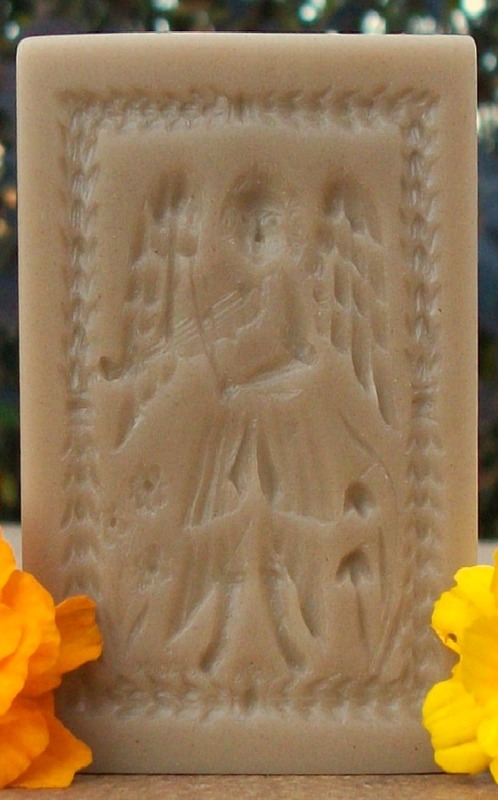 This mold measures about 6 5/8″ x 4″ and will deliver a beautiful image of an Angel. The fingers on the right hand are raised in a blessing gesture and the object in the left hand may be a sword of sorts or a scepter. Some folks have suggested a recorder or horn. The details are nicely carved and the depth of the image is very nice. As an ornament, it would be beautiful painted with royal blues, maroons, gold, silver, yellow and browns. I’m told the original mold was carved sometime in the late 1600’s to mid 1700’s. This mold is #1754 and sells for $68.11. A very beautiful and old image. Cookie made with mold #1754. 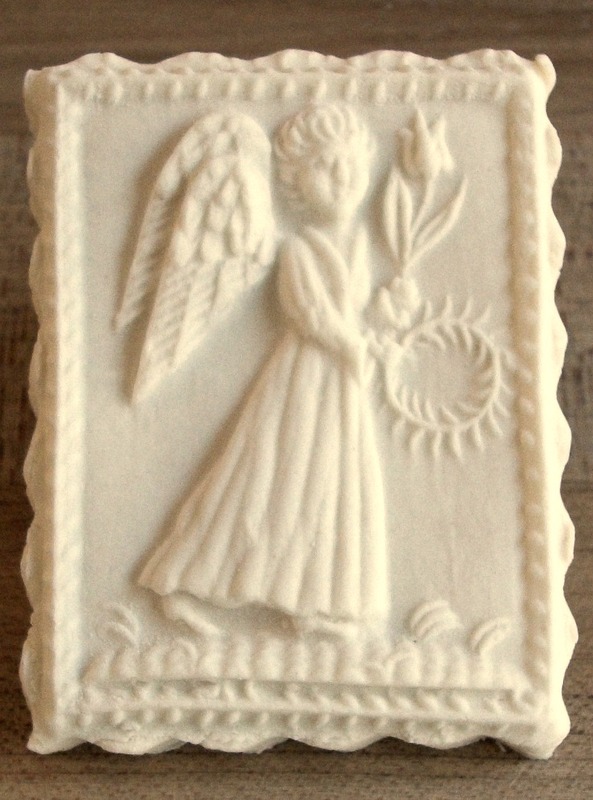 This mold measures about 3 3/4″ x 2 3/16″ and will deliver a beautiful image of an Angel. A design from about the 16th Century. The fingers on the right hand are raised in a blessing gesture and the object in the left hand may be a sword of sorts or a scepter. Some folks have suggested a recorder or horn. The details are nicely carved and the depth of the image is very nice. As an ornament, it would be beautiful painted with royal blues, maroons, gold, silver, yellow and browns. This mold is a smaller version of our #1754 (6 5/8″ x 4″). We made this smaller version so that this design would fit nicely on a cookie tray. It has grooves on its sides it to assist in removing it from the dough. This mold is #520 and sells for $53.60. 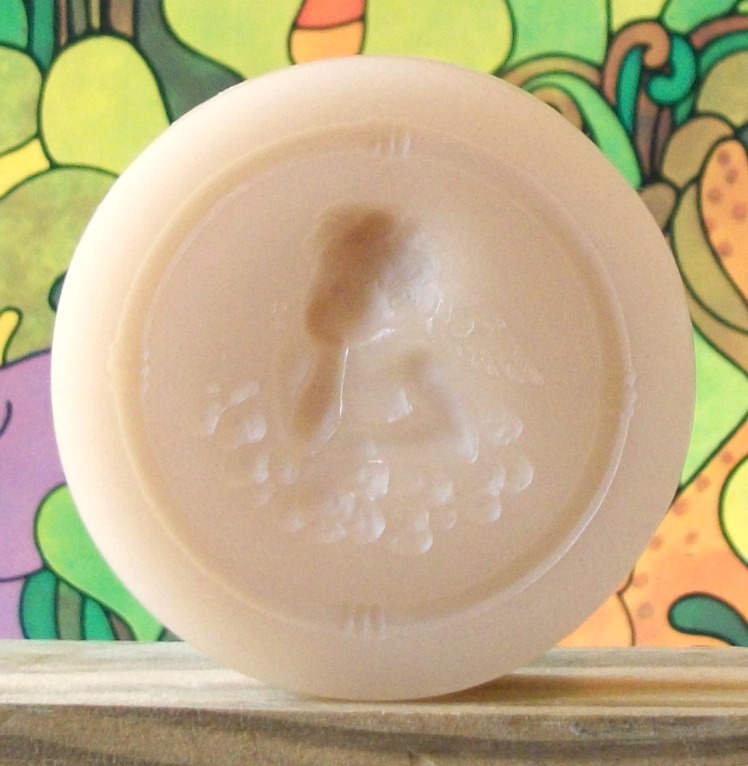 A clear or color tinted copy of this mold will cost an extra $6.70. Cookie made with mold #520. #1621 Eva’s Angel untrimmed and trimmed. 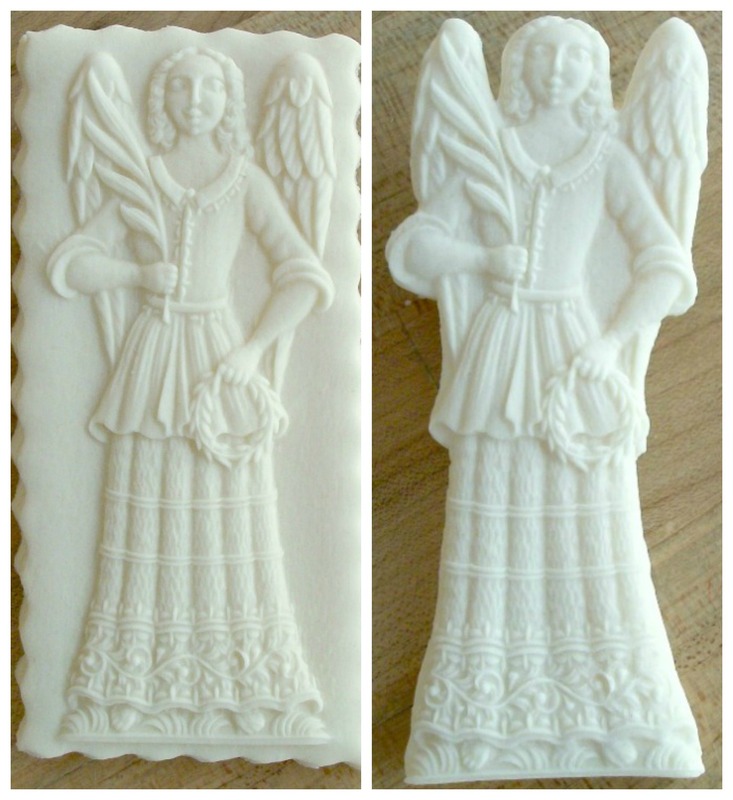 #437 Small Eva’s Angel Mold – $24.75. 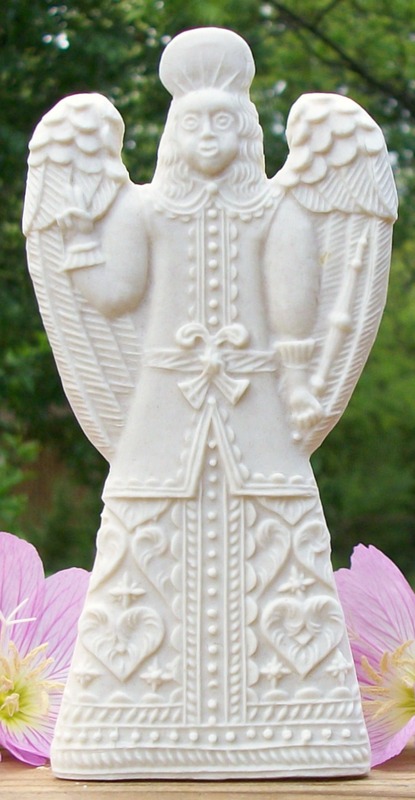 This beautiful Angel has great detail that is very fine with lace and filigree work in the clothing being easily seen. Her fingers, toes, wing feathers and curls are all also seen. She is holding what looks like a wheat wreath (which is said to symbolize sustenance and fertility) in her left hand and what looks like a palm branch in her right hand. 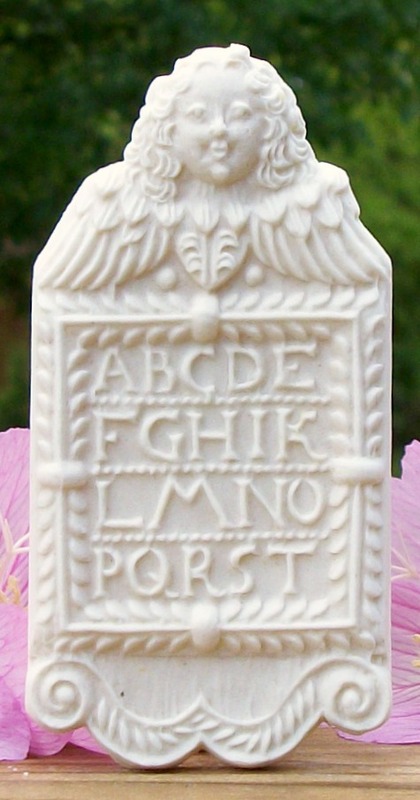 This mold measures about 2 3/4” x 1 ½” and is a smaller version of #1621. This mold is #437 and sells for $24.75. A clear or color copy will cost an extra $3.09. 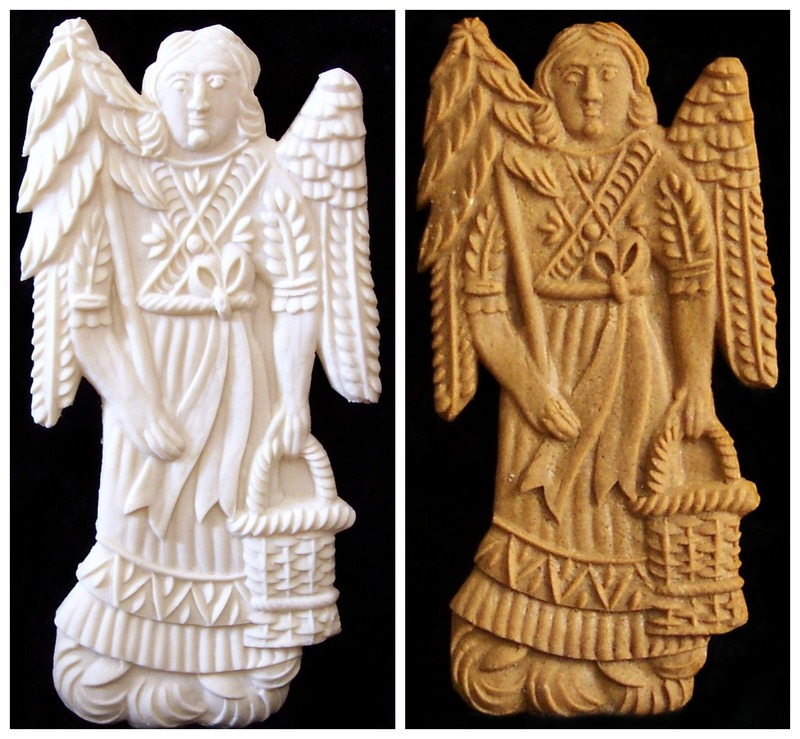 Cookies made with mold #437 Small Eva’s Angel trimmed and untrimmed. 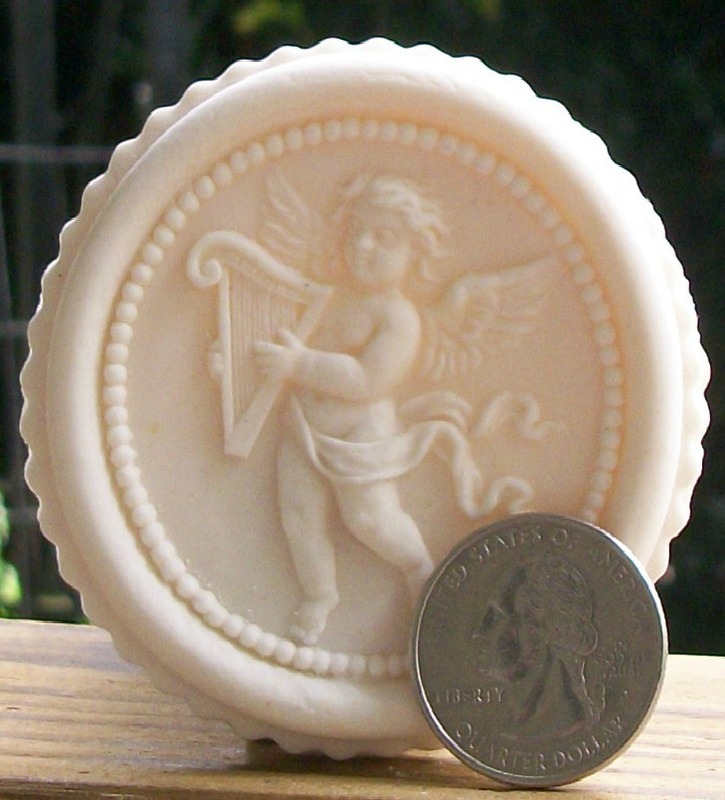 This mold measures about 5 3/8″ in diameter and produces a deep image of Cupid playing a harp. The image is detailed and beautifully carved. The original mold is from about 1880 and was sent to us by Frau Menzen. The original mold was intended for marzipan, but I have successfully used it for a cookie made with Springerle dough. This mold will produce a very artistic cake topper for Valentines, an anniversary, or simply to say “I love you”. This mold is available in 3 sizes; this is the largest one. This is #1917 and sells for $46.45. 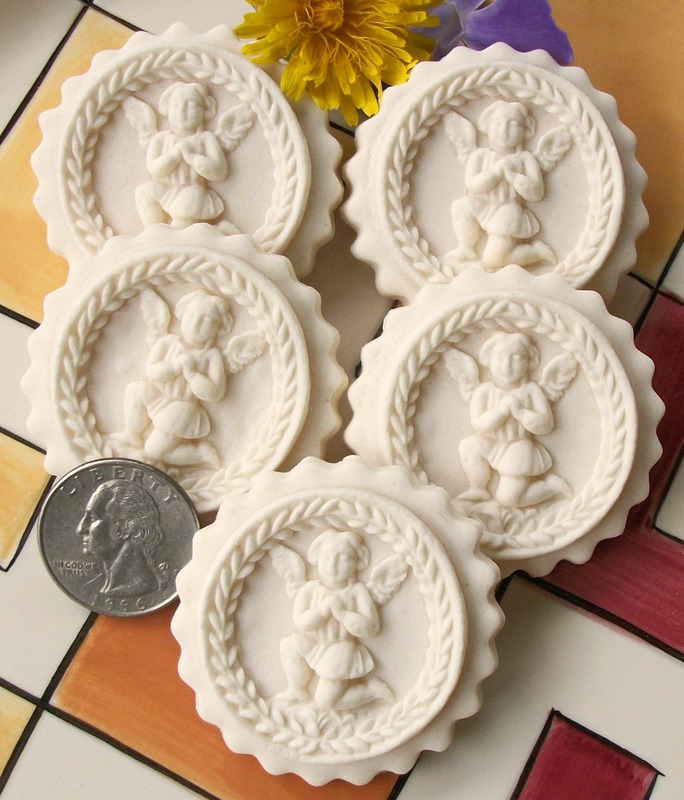 #421 Small Menzen Cupid Mold – $31.65. 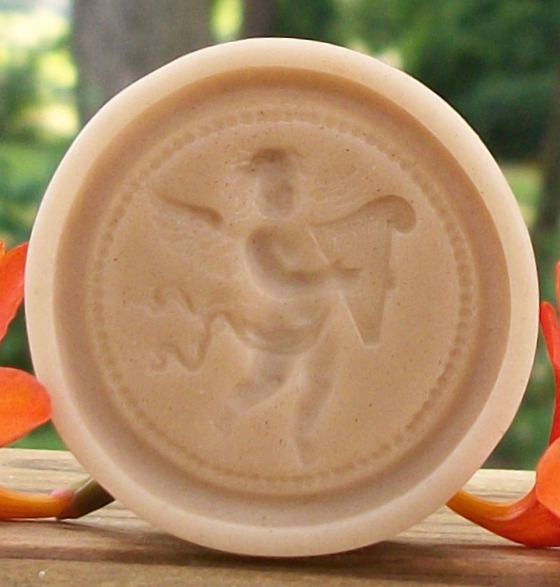 This mold measures about 2 5/8″ in diameter and produces a deep image of Cupid playing a harp. The image is detailed and beautifully carved with delicate small pearls encircling it. This mold will produce a very artistic cookie or confection for Valentines, an anniversary or simply to say “I love you”. This mold will also produce a great image for a cup cake topper. Great for wedding showers or Teas. This mold is the small (medium sized) version of #1917. This mold is #421 and sells for $31.65. Cookie made with mold #421. 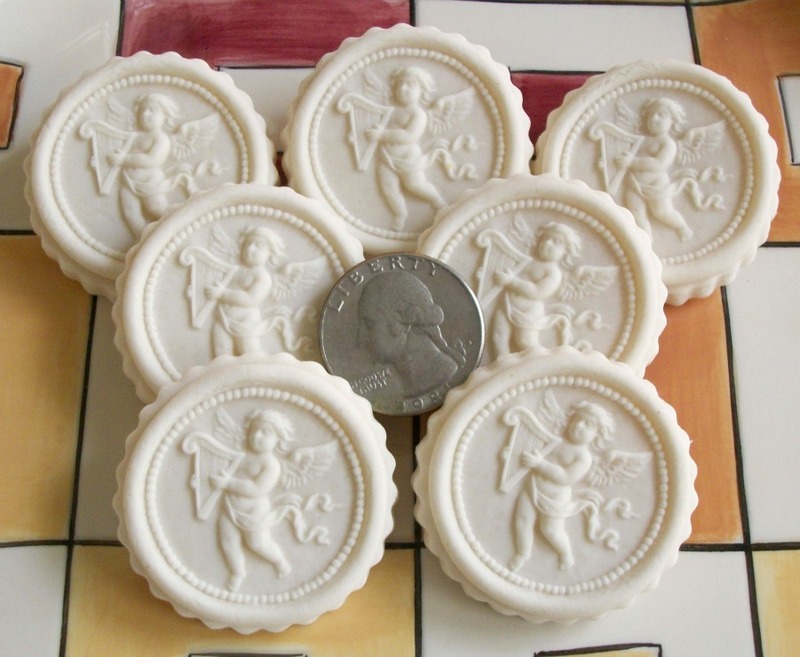 #435 Tiny Menzen Cupid Mold – $16.95. 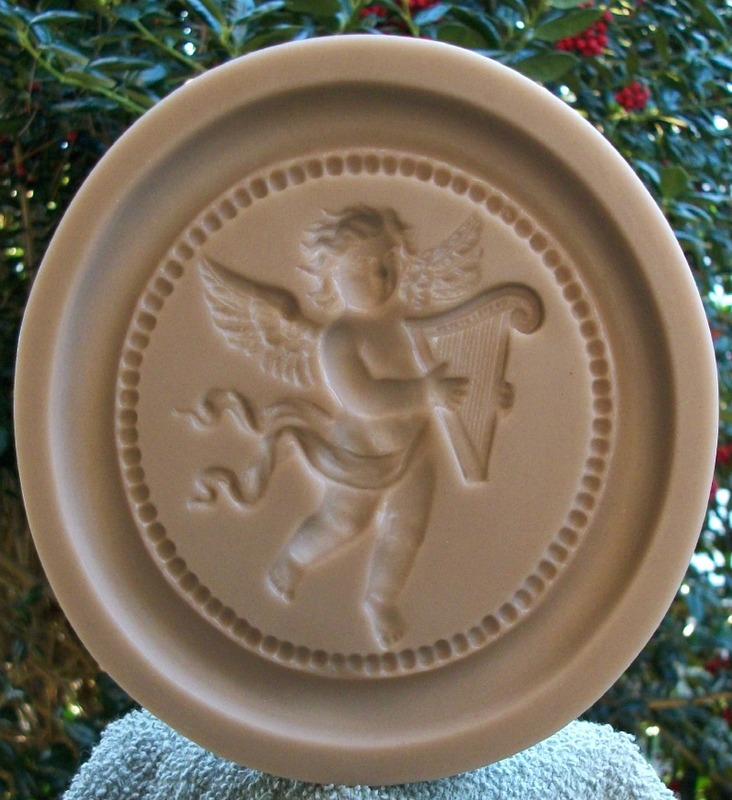 This mold measures about 1 5/8″ in diameter and produces a deep image of Cupid playing a harp. The image is detailed and beautifully carved with delicate small pearls encircling it. This mold will produce a very artistic cookie, butter mint or confection for Valentines, an anniversary, or simply to say “I love you”. Great for wedding showers or Teas. This mold is #435 and sells for $16.95. This mold is the smallest version of #1917. Even at this tiny size all of the details that are present on the bigger version are clear and visible on this mold. 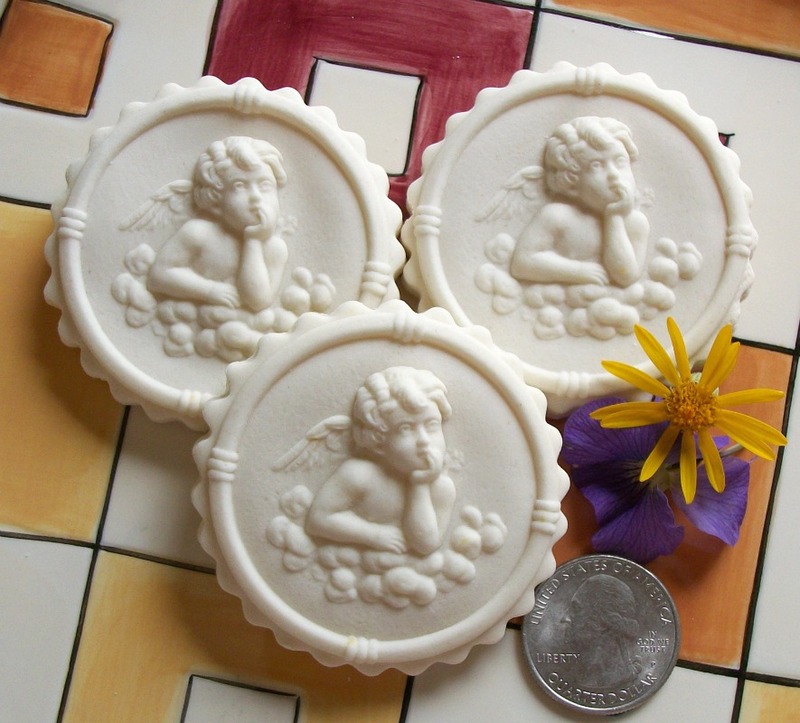 #435 Tiny Menzen Cupid Mold. #522 Junior Cupid in Clouds Mold $34.18. This mold measures about 2 7/16″ in diameter, with the image area measuring about 1 15/16″ in diameter. 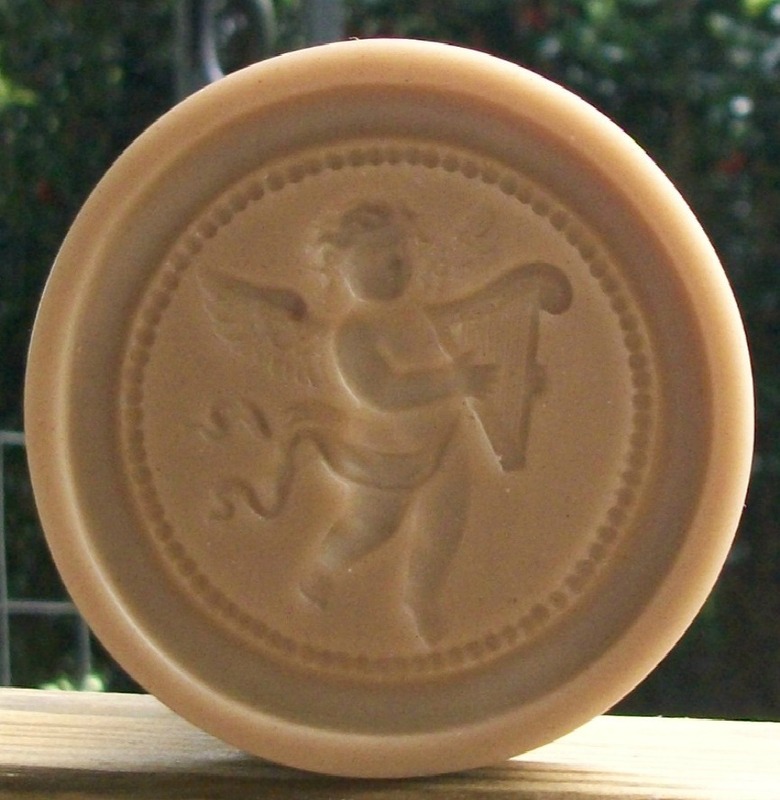 The image this mold produces is reminiscent of Raphael’s Cupid. The image is deep and detailed down to Cupid’s eyes. The image has a very simple but classic border that lends itself well to the overall beautiful appearance of the image. This mold has a groove around its side to help assist in lifting after pressing. 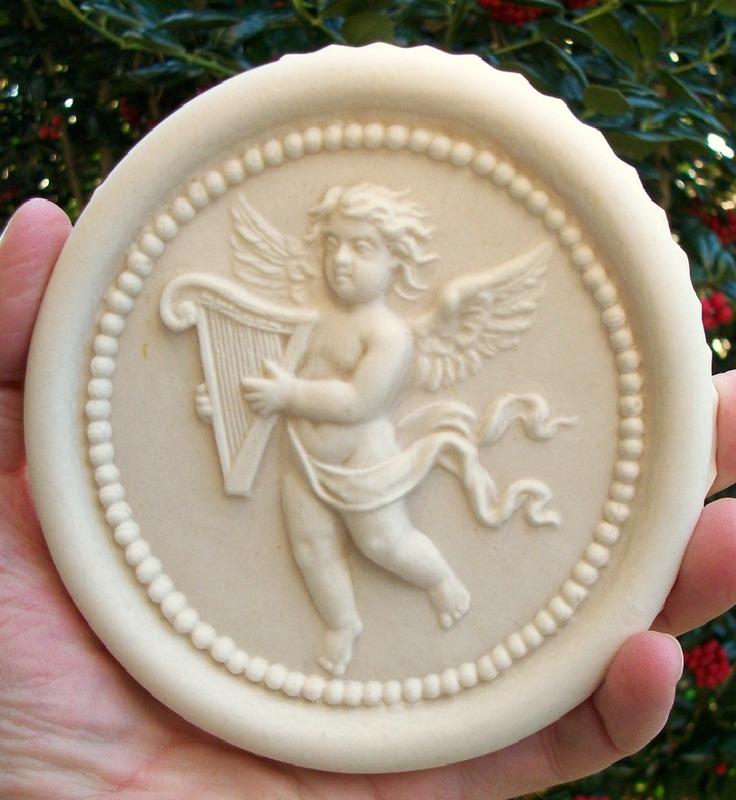 This mold can be used for cookies, Marzipan, Chocolate Clay, Confections and various crafts such as paper castings. This mold is #542 and sells for $28.16. 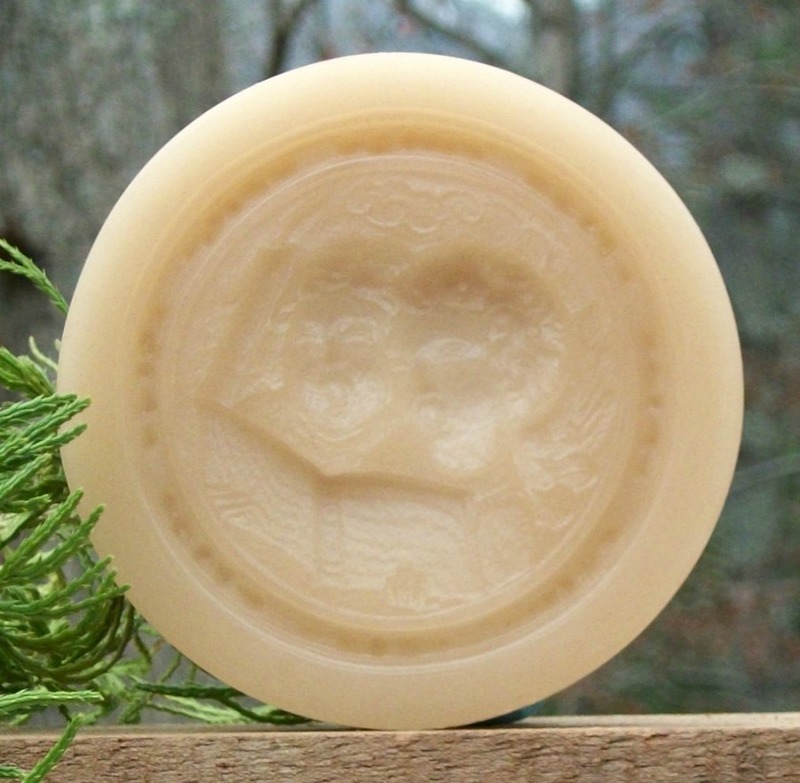 A clear or color tinted version of this mold will cost an extra $3.94. 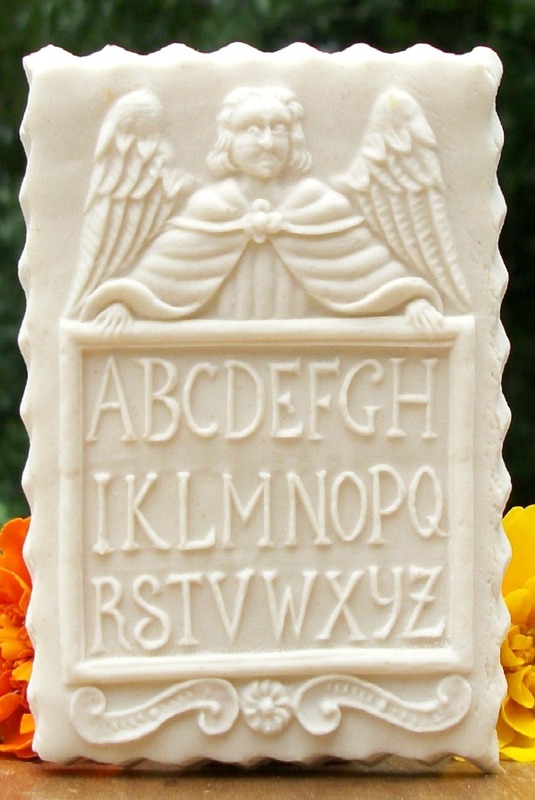 We also offer a slightly smaller version of this mold (#542) which has a border added to it. Cookies made with mold #522. This mold is a slightly smaller version of #522 and measures about 2 7/16″ in diameter, with the image area measuring about 1 15/16″ in diameter. 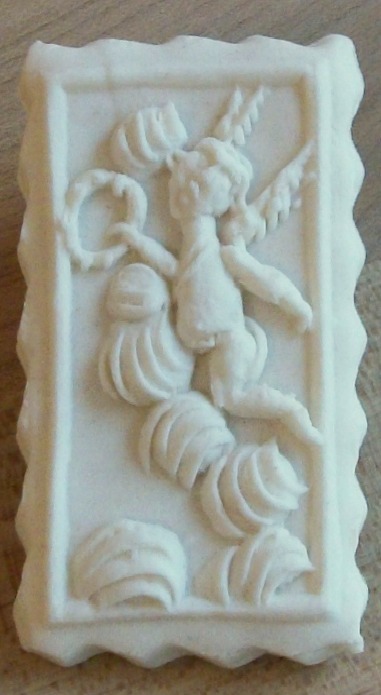 The image this mold produces is reminiscent of Raphael’s Cupid. The image is deep and detailed down to Cupid’s eyes. The image has a very simple but classic border that lends itself well to the overall beautiful appearance of the image. This mold has a groove around its side to help assist in lifting after pressing. 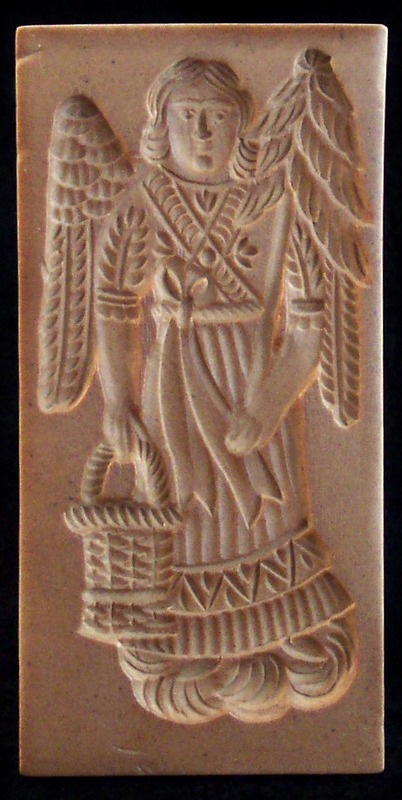 This mold can be used for cookies, Marzipan, Chocolate Clay, Confections and various crafts such as paper castings. This mold is #542 and sells for $28.16. 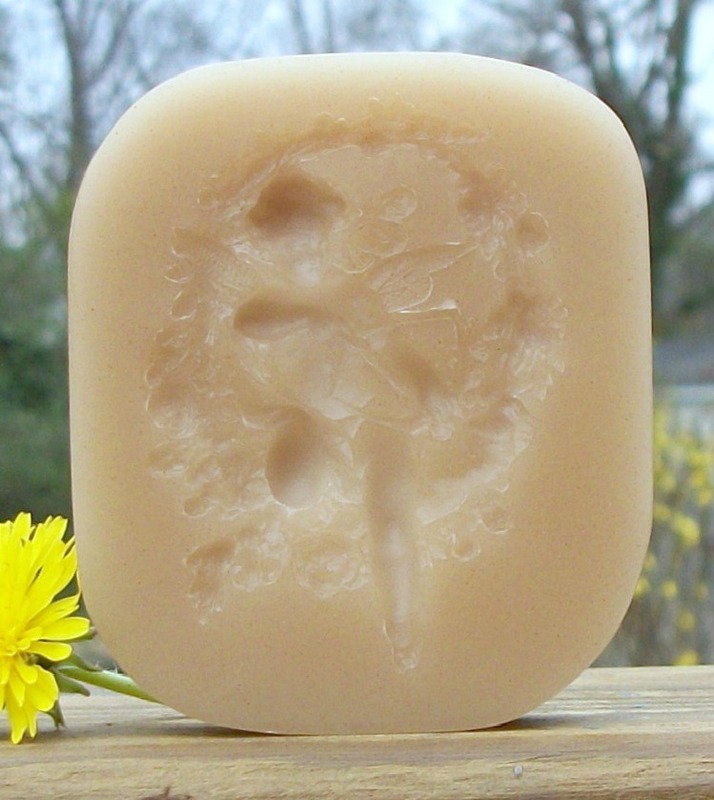 A clear or color tinted version of this mold will cost an extra $3.94. 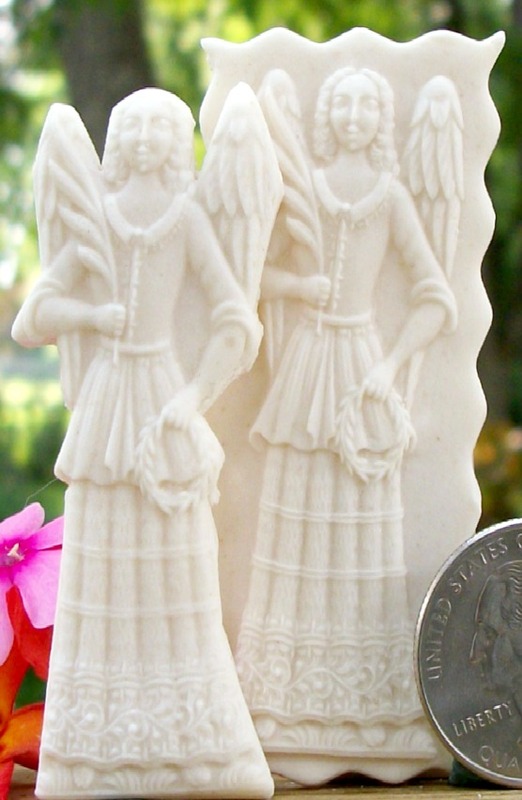 #1864 Kneeling Angel Mold – $22.39. 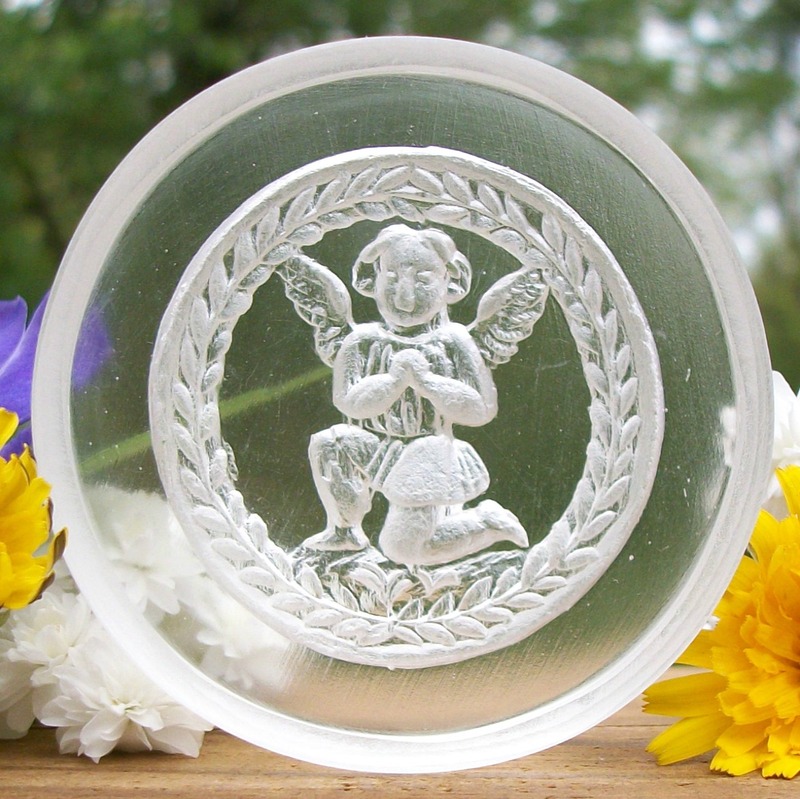 This mold measures about 2″ in diameter and delivers a beautifully small image of a kneeling Angel in prayer. The image is ringed by a very nice herringbone design. The image has good depth and details. 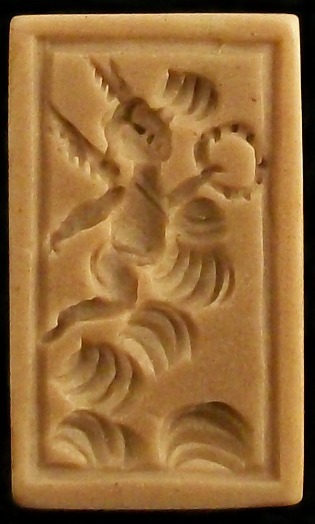 This mold will produce a very nice one to two bite cookie or confection. This mold is #1864 and sells for 22.39. 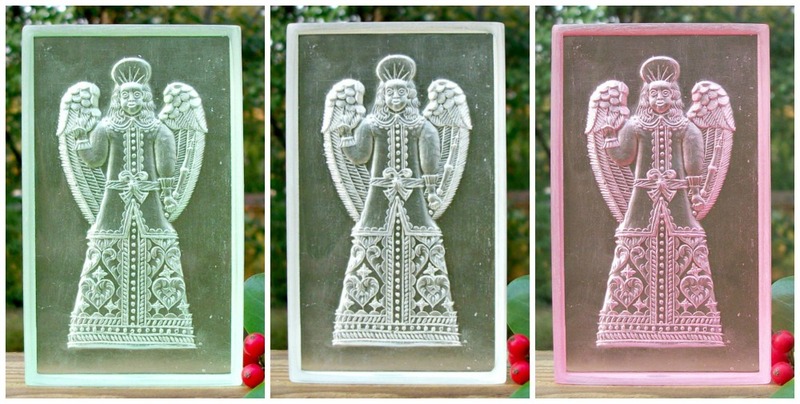 This mold is available in clear or color tinted for an extra $2.80. Cookies made with mold #1864. 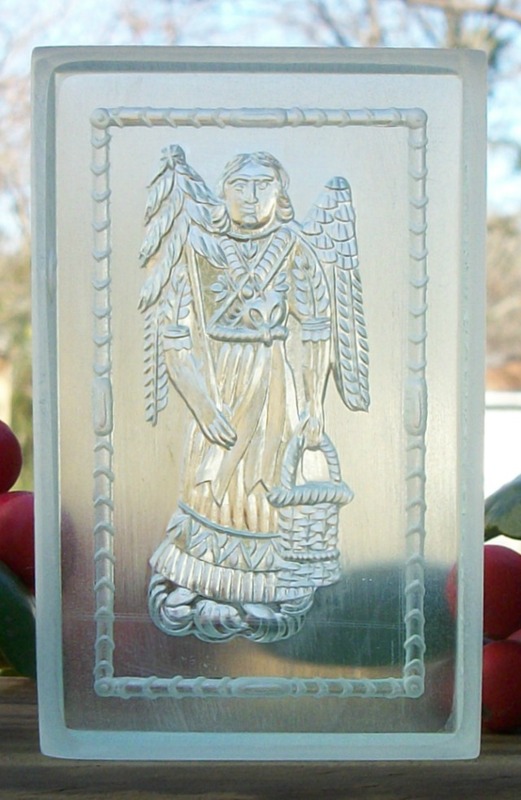 #1864 Kneeling Angel Mold in Clear. You are viewing this mold from the backside. 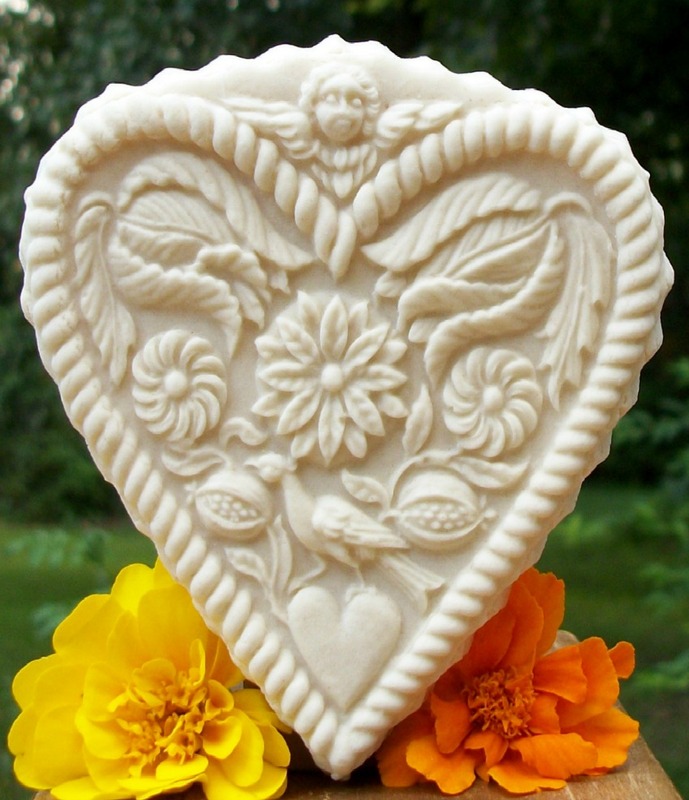 #2384 Blessings Heart Mold – $43.75. 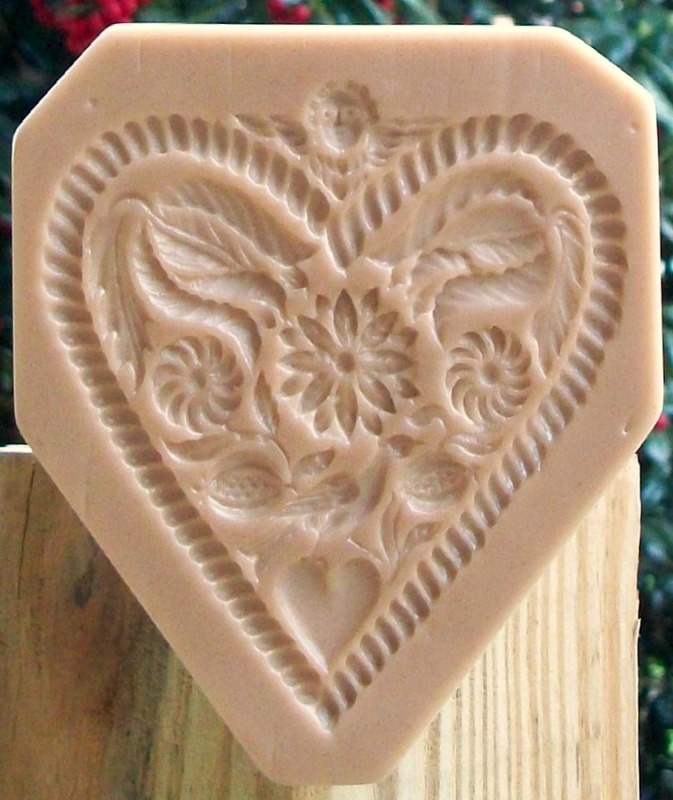 This mold of a Heart measures about 4 1/4” x 4”. It has great depth and details and great symbolism. The angel at top; a guardian angel. Whereas the pomegranate represents abundance, prosperity, and fertility. The heart certainly symbolizes love and the bird on the heart could symbolize love and longing. The poinsettia symbolizes success or celebration. The flowers could certainly symbolize purity and loyal love. A great motif to be given as a token of love. This mold is #2384 and sells for $43.75. Clear or tinted copies of this mold will cost an extra $5.47. 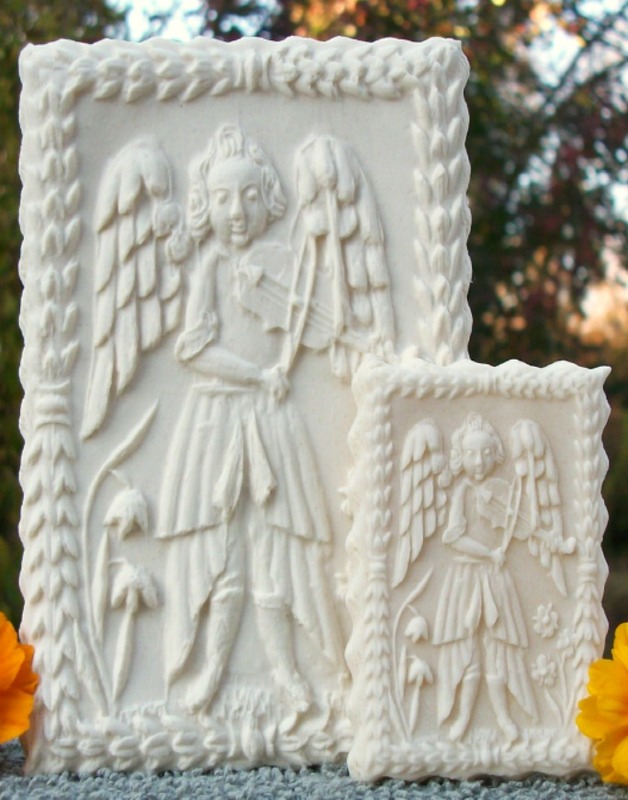 This mold measures about 3 1/2” x 2 5/8” and features a Hornbook that is being watched over by an Angel. The letters J and U do not appear on this board. Why? Several old hornbooks I’ve seen have had a letter or two missing and usually they were J and U. The details are great with even the tip of the Angel’s nose showing up on the cookie. Beautifully carved. This mold is #1850 and sells for $37.25.